[2010 - 2013] You know what's funny? It takes a moment to test a product but it seems like an eternity sometimes before I get to talk about it. Case in point, I tried this new (for 2010) flavor Wednesday night and I'm still trying to get my thoughts out ...I forget what happened that night, but I had some more last night and I was all ready to start writing, but I got an email that totally threw me off course (but more on that in a few weeks). Anyway, let's get down to business! At first glance, it's fairly plain looking. I actually expected it to be darker to match the normal peanut brittle color. I check but there is no strong aroma, just a hint of peanuts. Now that's better. Now we see lots of small caramel swirls, plenty of small peanut brittle chunks, and a scattering of larger peanut brittle chunks about the size of a large pea. The peanut brittle is made of the peanut brittle coating and parts of peanuts, no whole peanuts (not that I've seen anyway). I guess I expected all the chunks to be big, as if someone had smashed peanut brittle and thrown it on top, but no matter, looks are one thing, and they can help, but really it's all about taste. I take my first bite and ....I'm a little thrown off actually. I take a few more bites and I'm struck by a weird vibe. I take a few more bites and it sinks in. When they say it tastes like peanut brittle, they are really going for it in a "unique" sort of way. Now let me clarify before we continue: I don't eat peanut brittle very often, but I am a big fan of things like Crunch 'n Munch. It's a fairly balanced treat (tasty but not too fatty). Now when you have something like Butter Toffee Crunch 'n Munch, there is a funky smooth vibe to the whole thing, it's the way the coating feels as you crunch. Well, that same smooth notion is here in this ice cream. It takes a little getting use to. Actually, now that I think about it, it reminds me a bit of the buttery nature of Blue Bunny Ice Cream. The problem for me is that I haven't gotten use to these kinds of ice creams, so it seems to be on that borderline of unnaturally smooth. I love super creamy, it's just that super smoothness has a limit for me I guess. I have settled into it now more or less, but it's definitely going to keep this off my list of favorites. As I was trying to figure out the funky vibe, I took some bites of the ice cream by itself. It wasn't hard to scoop around the brittle bits actually. 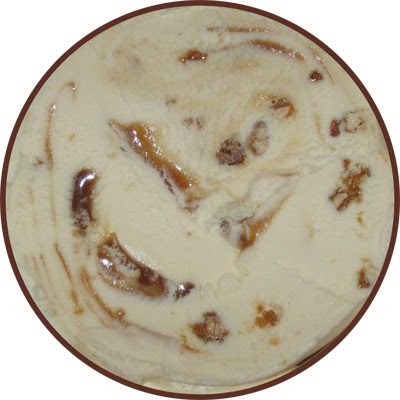 The base ice cream is actually very mild, it only really struck me as a hint of flavor, nothing major. 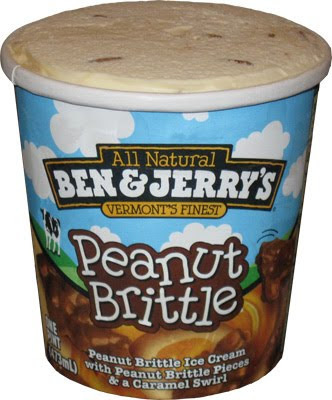 It's when you get the caramel swirl and brittle bits in your scoop that you really get a nice flavor going. I'm definitely enjoying the crunchy bits. They are fairly taste, and have a nice soft crunch to them -- what I mean is that they are crunchy and fresh, but it's an easy crunch, not a hard pretzel kind of crunch. Someone mentioned that they felt it had a sweet n' salty mix going on, but I'm not sure if I describe it that way. It's pronounced, and it's not a mild flavor, I'm just not comfortable using the term salty here. The swirls are nice too. They tend to be small, but it's a nice quality caramel with a middle of the road flavor, nothing overpowering or artificial here. That's always a positive with Ben & Jerry's, no artificial flavors! I definitely enjoyed my second scoop more than the first. I knew what to expect and just tried to focus on enjoying my treat. I do think this will find it's way into the hearts of some of you, but for me, it's just not winning me over. It's something different but I just don't foresee craving it anytime soon.